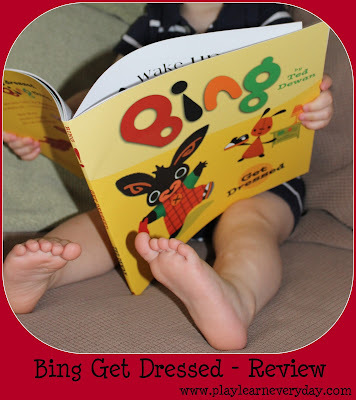 Today we have been reading Bing Get Dressed. We received an advance copy from Harper Collins as the book will be re-released on August 1. You can pre-order a copy now from Amazon for £5.94. It is a lovely book, Bing and Flop are very cute little characters and the story goes through Bing getting dressed, putting on one item of clothing at a time. It is a great book to read together with Ethan as he can point out many of the items when I ask him to, and there are several items of clothing that he can now say, which makes it good for his Communication, Language and Literacy development. The book also has a situation at the end, where Bing has an accident and has to get dressed all over again. A somewhat funny situation, and I'm sure all too familiar for potty training parents, but I think it's a lovely realistic touch. I'll definitely have to be sure to revisit this book when Ethan is potty training. It's nice to reassure him that it's ok to have accidents and we just get dressed again. Ethan really enjoyed the book. He liked pointing out the different things that he could recognise in the pictures. He thought it was very funny when Bing forgot to put on his dungarees before his shoes. We also looked together at the pictures at the end which have the clothes in different orders and chose which order Ethan gets dressed in.